Don’t really know where to begin, since Freedom by Jonathan Franzen is a huge book. Huge in many different ways, not only because it has many pages. In fact, I am feeling slightly like I should let more literary people with more knowledge of moderne literature in American deal with reviews of this one, since I am bound not to do this work justice. I shall, however, try. You do not need to be especially well versed in literature to see why the book is called Freedom though, because basically it is a story about how “we” (moderne people in the Western World/USA) deal with the freedom incorporated into our lives from the day we are born. It is about how we use this freedom, and also about how we misuse this given freedom. The story begins with a tale of the Berglund-family and their neighborhood, a typical middle to low upper class neighborhood in St. Paul. The Berglunds (Walter, Patty Jessica and Joey) are like families are most, or so we think when we begin our journey into their lives. This takes us through the marriage of Walter and Patty and parts of their childhoods and youth as well. Some of it is told by Patty (in third person) as a biography, some is told in third person by the author. I don’t think you can state that this is an ordinary family’s ordinary story, because it is not. I guess some of the things happening during Patty and Walter’s lives are so ordinary that they could happen to anyone. But then again, looking back at especially Patty’s past and what she comes from, it is not so ordinary. And what is up with their son, Joey and the neighbor’s daughter Connie? And the daughter Jessica and her ice queen attitude towards her mother? And the rock musician Richard, a college friend of Walter, even though they are each other’s opposites? You have to read to find out. The weakest thing in the book, which unfortunately also is pretty central to the whole book, is Walter’s work in Washington DC. Well, it may not be a “weak” thing as such, more likely it was because I had trouble understanding the meaning of those political maneuvres, I think. As long as they were not talking politics, it went well, and it is, like I said, rather central for how the lives of those people is shaped. Freedom is a monumental story centered around a very small cast of characters, and it is written in such a brilliant language that it was more than a pleasure to read it, even though it did take me longer than usual to read. I recommend this to all interested in modern literary fiction. But now I am ready for some lighter reading. PS. 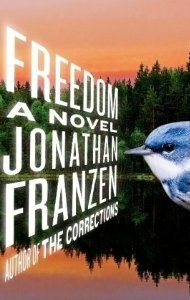 I like Franzen better than another famous American writer by the same first name, Jonathan Safran Foer, because Franzen doesn’t feel as pretentious as Safran Foer, but that is just my personal opinion. PPS. The image is of the European cover of Freedom which makes much more sense than the American one. Lu from regular rumination reviewed Freedom here. I have this sitting on the shelf, but I must confess, I'm not all that excited about reading it. the image is not from the European cover. it is the US cover. softdrink, one day you will get around to read it. Its a good read, but one needs to have the time to read it! Politics in Washington? Well, I have thought about this one, but it sounds too much like work. But I liked the only Safran Foer book I have read a lot. It was Extremely Loud and Incredibly Close. One thing I liked about it was the boy who seems a bit like an Asperger (I am the mother of one), and I think JSF hit that tone quite well. I've been on the fence about reading Franzen. Hummmm.Still not quite sure. I agree with everything you said here! I just finished this one and I have to admit I loved it. As for the issue with Washington politics, unfortunately the book was very realistic!